Todays post is my ATC sized tag for the challenge running over at Somewhere to be me , a blog written by my very talented teamie Sandie. 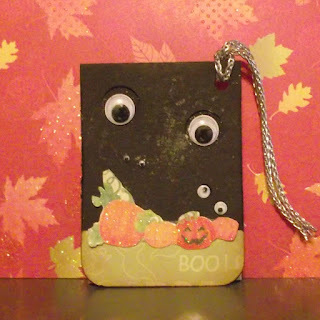 The challenge is to make something spooky for Halloween and I chosen an ATC sized tag that could be used to decorate some of those goody-bags for trick or treating. Thanks for stopping by to read my blog. Your time and comments are appreciated. Please take a few moments to check the Somewhere to be me blog and see the great work created by Sandie. Aw Angie,this tag is so cool.I love it. Thank you so much for entering my little challenge. My foray into digital srcapbooking!